The newly designed Women’s UA Valsetz RTS of 2016 replaces the popular Valsetz that was made popular by SWAT professionals all over the country. 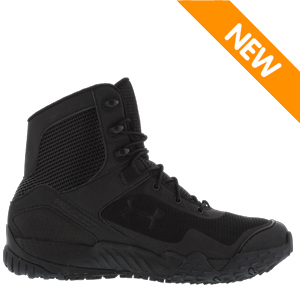 Built like a running shoe, this boot features Under Armour's patented Clutchfit which forms to the contours of your foot for better feel, fit, and comfort. A lightweight TPU shank provides torsional support and rigidity to reduce foot fatigue and foot pain. The Valsetz RTS is 7 inch in height to provide maximum ankle support and foot protection for challenging terrain. This women's specific boot is sized for the smaller female anatomy.